When I used to live in Russia, we called this a subbotnik. A Saturday when you were obliged to volunteer at your place of work doing all sorts of jobs like cleaning and tidying. And doing it for free. And what was good for Bolshevik revolutionaries is good enough for our little communist commune. I’ve never explained the strange arrangement we have in our village. 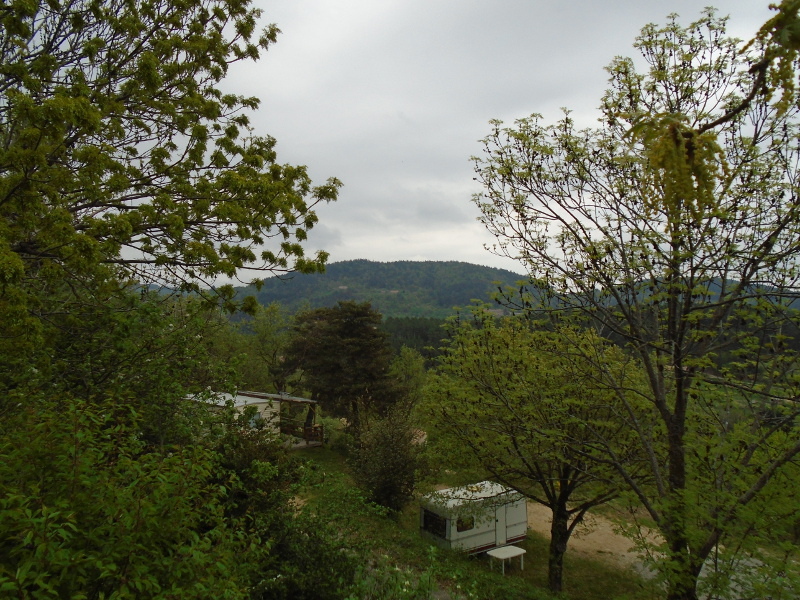 Our Ardèche region is Socialist, but our tiny commune – population less than 400 goes one step further left. The mayor, the deputies and the councillors on our council choose not to take any salary for their work; instead they donate their small wages back to the good of the commune. And as a result of this benevolent act (and they have done if for decades) the residents of the village and the surrounding area feel obliged to give back too. Many of us are assigned tasks according to our abilities. It is an informal process and those who have no wish to join in this process are never forced to participate. You will not be surprised to learn that I have been given the job of translations and help with websites. There are information panels at beauty spots with my translations which makes me absurdly proud. And at the end of May every year I supply flowers and plants for the village and plant bulbs each autumn. Yes, I have to count my blessings. And we are blessed that everyone will pitch in when needed. And this weekend we were all gently summoned to help fix up the camp site for the opening of the season. 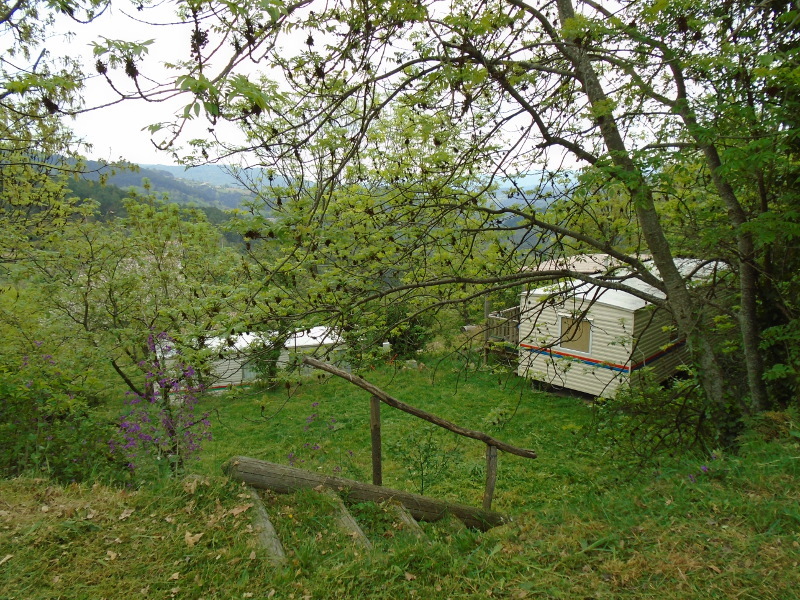 This campsite with its large swimming pool is the main income our village receives. The pool is heaving in summer with tourists and residents (who get a pool discount over the summer to swim any time for a fixed rate). 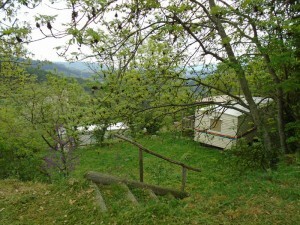 There are about 20 fixed caravans over the few acres of woodland. Plus large tents, a cafe, a tennis court and the pool. I’ve never really explored the site before but it is large and pleasingly wooded. 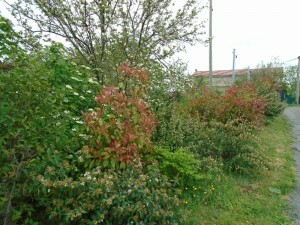 And I was pleased to see the mixed hedge I helped to plant four years ago is growing well. I can imagine that it must be a fun place in summer. But this weekend it was all hands to the work. Our subbotnik. We were asked to turn up from 8am and bring tools. I drove over with loppers, secateurs, gauntlets and kneeler pads. And my camera. And it was heaving. There were people mowing, four men had strimmers, people were cleaning, pulling down broken bits of fencing, cutting back brambles. And the cover on the pool had come off for a serious clean. And naturally there were plenty of breaks for coffee and chat and laughter. I did my three hours – the eleagnus hedge behind the pool needed a serious prune which I quite enjoyed. But I have to go back as word has got round that we are in possession of the only chipping machine in the area. So I’ll get help to load the chipper into the back of the car and head back on a quieter day when the campsite will be sparkling and clean and ready. And a pile of branches will be waiting for me to turn into wood chip mulch.